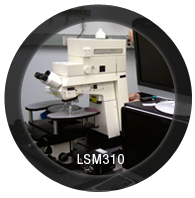 LSM Tech offers a variety of products for Confocal Laser Scanning Microscopes and standard microscope peripherals. Our products have stemmed from customer needs and are designed to improve the versatility of your microscope and the quality of your images. 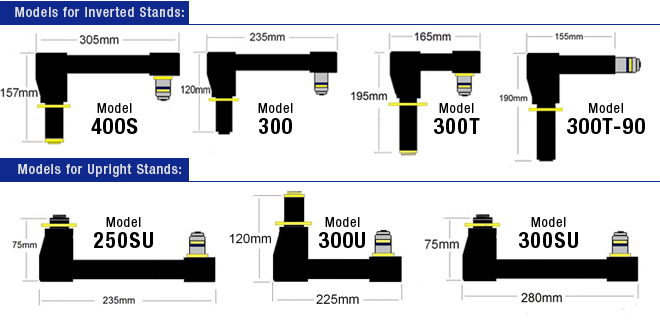 Our products are designed to fit virtually any light microscope configuration. We can also custom design our products to fit your specific requirements. This innovative device is a unique tool for intra-vital microscopy. It converts any inverted microscope into an upright by simultaneously changing the orientation of the objective and moving the sample off of the stage. This allows maximum flexibility in sample positioning and handling. Focusing can be done by the microscope, an objective mounted piezo device, or positioning of the sample when the objective is tilted off axis. 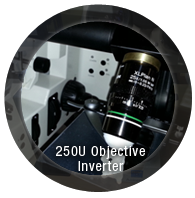 The InverterScope® objective inverter may be used on a conventional microscope as well as confocal or multi-photon laser microscopes. 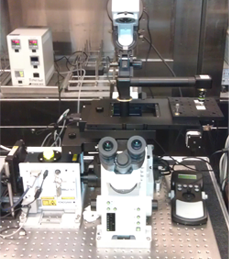 This device allows you to perform live cell imaging with a water immersion lens on an inverted microscope system that would normally require the use of an upright microscope system. Available in both a 180 degree, full inversion model or a 90 degree, right angle model. The objective head can be positioned 360 degrees in any direction. 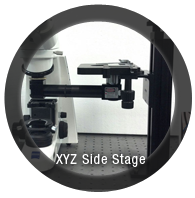 Please see the XYZ side stage product which is used in conjunction with the InverterScope® objective inverter. If you do not already have a solution for holding and positioning your samples to the side of your microscope, this side stage is a perfect solution. It allows vertical positioning as well as coarse and fine positioning of your sample or small animal. It can be adapted with a right angle bracket for vertically positioning your stage to scan samples at 90 degrees. 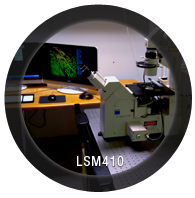 We specialize in the resale of Zeiss LSM 210, LSM 310, LSM 410 and LSM 510 confocal systems. 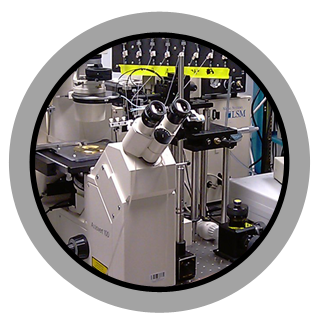 All laser microscope systems include complete system cleaning, alignment, and replacement of internal mirrors and optics as necessary. Our systems come with a full one-year warranty and include on-site installation and training. We can also upgrade existing PMT’s with cooled PMT detectors, add additional PMT detectors, and upgrade lasers. We can also upgrade the system computer. Please call us for complete details. 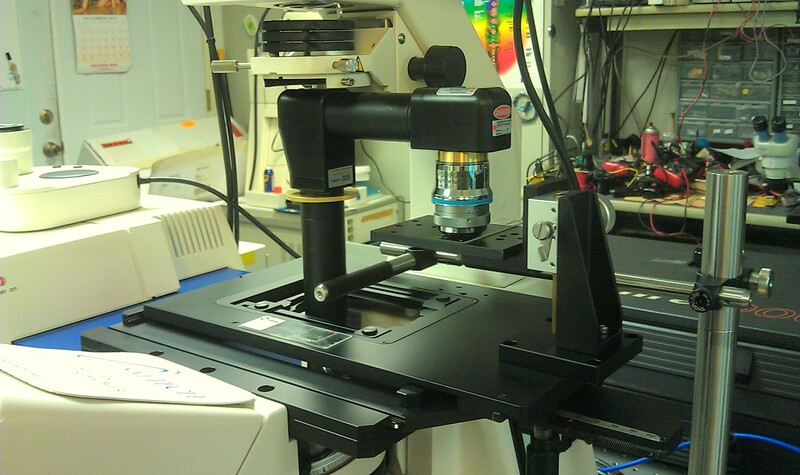 We currently have in stock both inverted and upright LSM 510 confocal Systems. Inverted options may include a 2 photon ultra-fast laser with NDD detection. 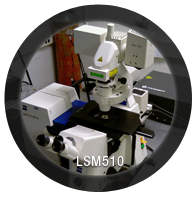 We offer a Controller Replacement Upgrade for the Zeiss LSM 510 Microscope. Learn more on our Upgrades page. May be configured as an IR (1064-1340nm) or UV (375nm) system. IR version has protected silver mirrors for excellent IR reflection. IR coated optics for high efficiency. UV version has UV enhanced aluminum mirrors and UV coated optics. 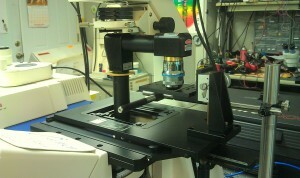 Biological version has VIS optics and dual or triple main dichroic for low light imaging. The factory original LSM 310 systems have a 50/50 or 80/20 neutral beamsplitter. We replace the main beamsplitter with a dichroic based on the laser lines. For example: 488/543/633, 532/635, 405/488/543.